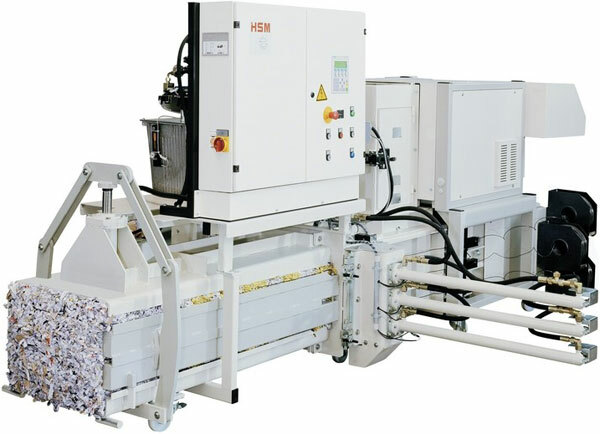 Extremely high performance conveyor belt document shredder, combined with fully automatic baling press (FA 500.2 and KP 100). Material intake via large loading table and electric conveyor belt or optionally by inclined conveyor belt and pre-shredder. Direct transfer of the material to be shredded to the downstream baling press. Keypad control for constant operation and reverse as well as automatic reversing in the event of a paper jam. Modern SPS controller with multilingual display and convenient menu navigation. Photoelectric cell for automatic control of the pressing process. Shredding and pressing conducted simultaneously. Integrated, manual oiler for cutting unit. Inspection door for press chamber (size 475 x 500 mm). Separate loading aperture. Fully automatic 3-fNEW strapping with patented coiled wire. Serially equipped with polythene bag attachment (basic equipment: 5 plastic bags). Made in Germany.